Fans have given a mixed reaction to The Strokes new track. As reported yesterday (January 25), The Strokes have returned with a brand new song, titled 'One Way Trigger', which you can download for free from their website,Thestrokes.com. An album of new material is also due out this year. Following the release of the new track, fans have been reacting on social media with their view on The Strokes return and the new song. We have collated some of those opinions, which you can see by scrolling down the page. Last summer, NME confirmed that The Strokes were working on the follow-up to 2011's 'Angles'. Reports that the band had been working on new material at the famous Electric Lady Studios in their home city of New York were quickly denied by their management and record label. However, guitarist Albert Hammond Jr's father revealed that the reports were true and the band were in the process of finishing up their fifth studio album. Asked if the band were recording, Hammond Sr said: "Albert says that the stuff they're doing is incredible. They're doing it themselves with their friend, engineer and producer. He just says, 'Dad, it's incredible'." When asked if he thought it would sound different from 'Angles', he said: "I don't think they'll go in a wildly different direction. 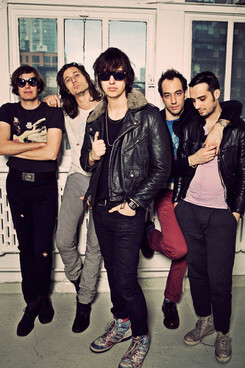 Obviously the songs will be different, but I think The Strokes are The Strokes; they always will be The Strokes."